The Pittsburgh Penguins (26-8-0) earned a tough defensive win, and 13th consecutive victory, in a 1-0 decision over the Montreal Canadiens (20-7-5) Tuesday night at CONSOL Energy Center. The game’s lone goal came in the last half of the second period, when Chris Kunitz hooked up with Sidney Crosby. But the most influential story coming out of the game was the Pens’ again-impressive defensive play. This was instrumental in the third after Marc-Andre Fleury suffered an injury late in the second period and did not play in the third. The Penguins now hold a seven-point lead over the Canadiens and Boston Bruins at the top of the Eastern Conference. Fleury continued his dominant stretch in net, stopping all of the 25 shots thrown his way, but was forced to exit the game after the second period (update here). Before he was hurt, Fleury put on a clinic of athletic saves throughout the first two periods. Arguably his most impressive save came with 11:26 remaining in the second period when he extended across the crease and flashed his right pad to stop Andrei Markov’s one-timer. 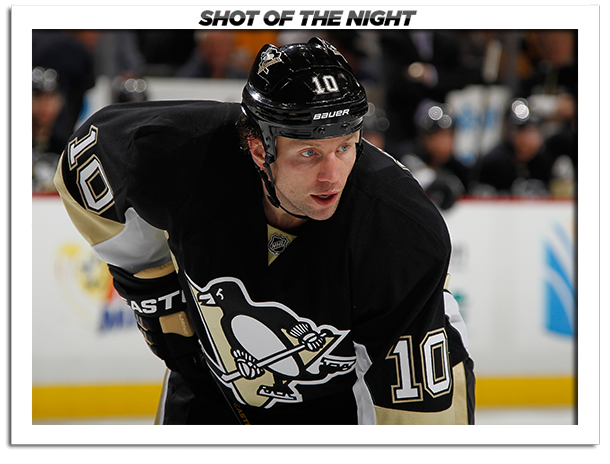 The Pens’ defense was just as impressive, getting in front of 16 shots. It allowed 12 shots through to Tomas Vokoun, who also continued his hot play by practically building a brick wall in front of the net, in the third. Fleury and Vokoun combined for the Pens’ shutout and have become a goalie dynamic duo, combining for a .964 save percentage in their last eight games. "You're going into the game when it's already going and we were winning so you don't mess that up," Vokoun said. "So you just go in and try your best and try to stop all of the shots." One of the game’s few offensive highlights came courtesy of the most productive line in the NHL, consisting of Crosby, Kunitz and Pascal Dupuis. The trio was responsible for yet another gorgeous goal. After collecting the puck off of a Brooks Orpik pass, Kunitz sent a cross-ice pass to Crosby, who streaked down the right side and sailed a wrist shot over Carey Price’s blocker and into the top-left corner of the net with 6:41 left in the second period. The trio of Crosby, Kunitz and Dupuis has scored at least one goal in the Penguins’ last 17 games. The Pens have gone 15-2 in that stretch and those three have combined for exactly half of the team’s total goals. "At the beginning of this year we kind of played hockey like we did last year," Kunitz said. "We don't want to follow the same routine. You want to learn from your mistakes. You're building as a team. We're trying to get better every night." Crosby, who has 14 goals and 53 points on the season, maintains a dominant 11-point lead over Tampa Bay’s Steven Stamkos in the league’s scoring race, while Kunitz is just one point behind Stamkos with 42. Kris Letang’s return seemed to play a large role in the defense’s ability to stymie Montreal’s attack. Coming off of a three-game hiatus, Letang logged over 21 minutes, second on the team behind Paul Martin, and spent time on the top power play unit and the penalty kill. "I felt all right," Letang said. "We'll chat with the doc and we'll see." While Letang returned from an injury, Brenden Morrow was another addition to the lineup after being acquired from the Dallas Stars on Sunday night. Morrow started the game alongside Brandon Sutter and Matt Cooke before moving to the second line with Dustin Jeffrey and James Neal. He also spent some time alongside Neal and Crosby. "I didn't really know what to expect," Morrow said. "I just knew these were two really good teams. I'm going to have more time to adjust. I'll be able to filter in the system a little bit better." The Pens newest winger saw 12:55 of ice time and didn’t register a shot on goal, but seemed to perform as expected. He spent a bulk of his time hovering around the front of the net and battling for the puck in the corners, making it difficult on the Canadiens to exit their zone. "It kind of felt like a playoff game," Morrow said. "Every shift mattered. You're up on your feet every time there is a scoring chance. It's a fun feeling."